The end of each quarter of school is always filled with stress and anxiety—final papers are due, students are trying to make up missing work that was due in August, teachers need to set up report cards for each of their classes. At every point in my life, the end of the quarter or semester has been incredibly overwhelming. As a second year teacher and Lasallian Volunteer, I found that I was hanging on by a thread at the end of our first quarter. I kept thinking to myself, “Wait…I CHOSE to do this again?” I continued to push through the stresses even though I was walking around like a chicken with my head cut off. As the questions kept coming and the students were getting upset, I became frustrated. 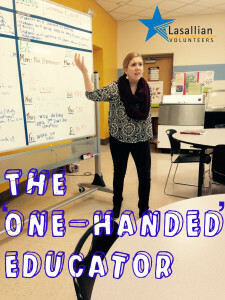 I stood up in front of the class and blurted out, “Guys, I only have ONE hand!” There was silence for thirty seconds and then everyone started laughing, including me. We took a few minutes to make sure I still had both of my hands and moved on with our class in a positive manner. This was one of the first moments in my LV experience when I realized that it’s okay to be human and make mistakes in front of the kids. I am definitely a perfectionist when it comes to work and teaching, and I found in this moment that you do not have to take everything so seriously. The students appreciate the times when you are real and show them that you can mess up sometimes, just like they can. Since this class, I have made a point to not let my frustrations or anxiety take over my class. I’ve tried to be more myself in the classroom. When I get to that breaking point now, I take a step back, take a deep breath, and think to myself, “I still have both of my hands, right?” This thought keeps me moving through challenging times with a smile on my face. 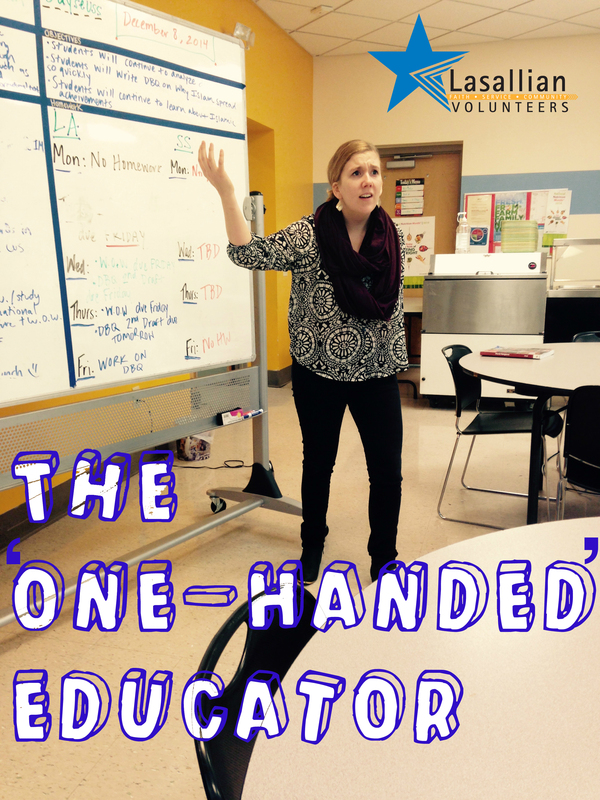 Megan McShane is a 2nd year volunteer serving at De La Salle Middle School at St. Matt’s in St. Louis, Missouri. Megan is a 2012 graduate of Manhattan College. This is hilarious, and I can’t believe I never heard this story!